HomeTagsPosts tagged with "rob lipsett"
Rob Lipsett has addressed claims that he was at the centre of an RTÉ Investigates episode last night. The programme was all about the use of steroids in Ireland. Video footage during the show featured what they described as a "well-known social media fitness blogger” buying the steroids. “This man claims to be a natural athlete on his social media account, where he has thousands of followers. However, it soon emerged that his ripped physique is chemically induced,” the presenter added. It was the description of a "well-known fitness influencer" that made viewers point the finger towards Rob. Taking to Twitter, Rob addressed the controversy head on: "Apparently @RTEOne did some steroid documentary and everyone thinks I was in it and my face was blurred out haha." "If I was on steroids do you think I’d be so stupid to go and talk about it on TV. They probably hired some knock off version of me." In another tweet, he joked: "Also if I’m on steroids I need to get a refund cause they didn’t work, been basically the same size for years." And then added: "Anyways cba watching the show, I’m sure it was interesting but I had nothing to do with it. Kinda want to meet the lad that everyone thinks is me though." Hopefully Rob's denial of purchasing and using steroids will have a positive influence on his followers to avoid the drugs entirely. Anabolic steroid misuse could lead to serious, even permanent, health problems such as: kidney problems or failure, liver damage and tumours. After Sarah Godfrey's Instagram statement regarding her past relationship with Rob Lipsett, the personal trainer and former Love Island contestant has issued a response. 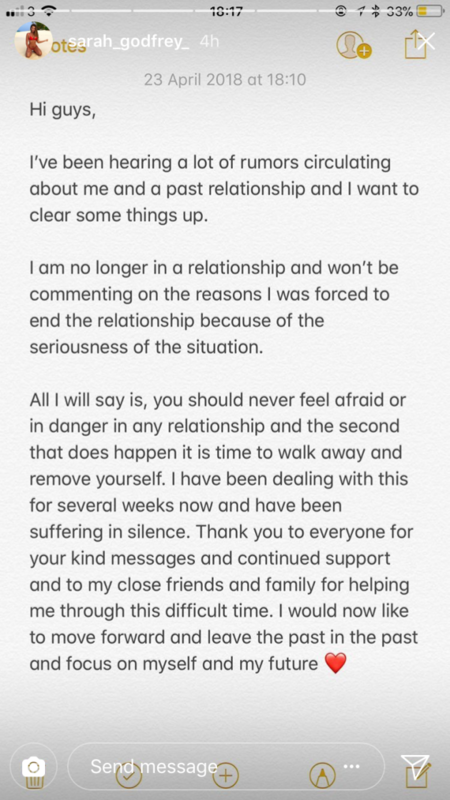 Sarah told fans that she had been 'suffering in silence' during the relationship, and urged anyone feeling 'afraid or in danger in any relationship' should 'walk away and remove' themselves. The statement caused much speculation regarding the private details of their relationship. 'It has come to my attention that my ex girlfriend of eight years Sarah Godfrey has been spreading malicious rumours and gossip concerning me and I am hurt and baffled by this betrayal,' Lipsett said, speaking to Goss.ie. 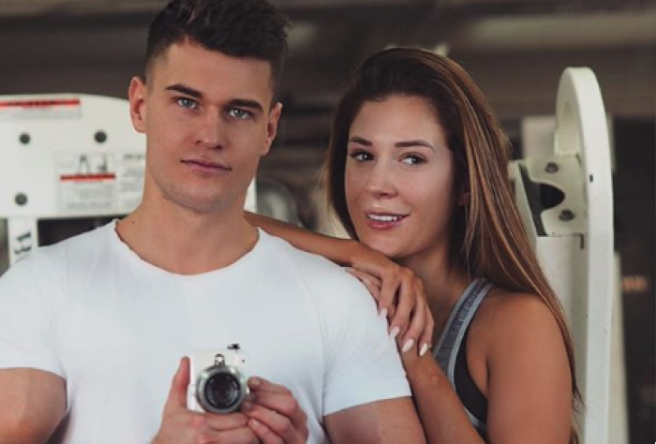 Sarah Godfrey and Rob Lipsett appeared to have the perfect Instagram relationship. From the gym to the white beaches of the Maldives, their comments sections were littered with the hashtag #couplegoals. However, the couple split a number of weeks ago, and Sarah took to her Instagram stories to make a statement. I am no longer in a relationship and won’t be commenting on the reasons I was forced to end the relationship because of the seriousness of the situation,' Sarah wrote. The couple have unfollowed one another on Instagram and have removed their online association with one another by deleting recent pictures. Irish Influencer Rob Lipsett has left Love Island. The blogger entered the reality show on Friday, however after nobody picked him to partner up with, he had to exit the show. Producers did you over royally, strong work forecasting that storm at least mate! If you are one of those people who just haven't gotten on the Love Island hype, that might be about to change. The romance-driven reality TV show has been dominating the headlines and Twitter feeds since the seriously saucy show began. The drama-filled villa is about to get 11 new residents, one of them being Rob. The news was officially announced last night, with Rob's social media pages posting his official Love Island mug shot. Now that the 25-year-old fitness fanatic has entered the show, we may have to tune in. The Dublin-based personal trainer gave his followers a hint that something major was on the horizon.